Summary: This is a super-versatile reverb that gives you tons of flexibility with reverb tones, whether you want to add a little “grease” or slather on the ‘verb thick and soupy. Pros: 10 presets plus it’s TonePrint enabled to give you virtually limitless reverb sounds. Cons: Can sound a bit monotonous between presets – very spring-reverby – but adjusting the decay and level fixes that easily. Tone Bone Rating: 4.75 ~ Once I sat down with the pedal for a few hours in my studio, I fell in love with it! This is is a great reverb pedal that can provide lots of different reverb options if you’re willing to explore its capabilities. Believe me, it’s totally worth it! I’ve been using my ToneCandy Spring Reverb for my solo acoustic gigs for the past couple of years. Hands down, there is no better spring reverb simulator pedal on the market. But one drawback of the pedal is that it is extremely sensitive to the power supply used with it. If it doesn’t like it, it’s noisy. Up until recently, I didn’t have a problem with its finicky behavior, as I had a power supply that worked just fine with it. But a couple of months ago, the OneSpot power supply that I was using with my acoustic board went on the fritz, and for some reason, the Spring Fever doesn’t like the new one, and the pedal would produce a very low-level, high-pitched buzz. I could filter it out a little bit with EQ and signal padding on my Fishman SoloAmp, but plugged into the restaurant’s board, the sound was noticeable. Frustrated by that, I remembered that I had the Hall of Fame reverb in my box of toys. 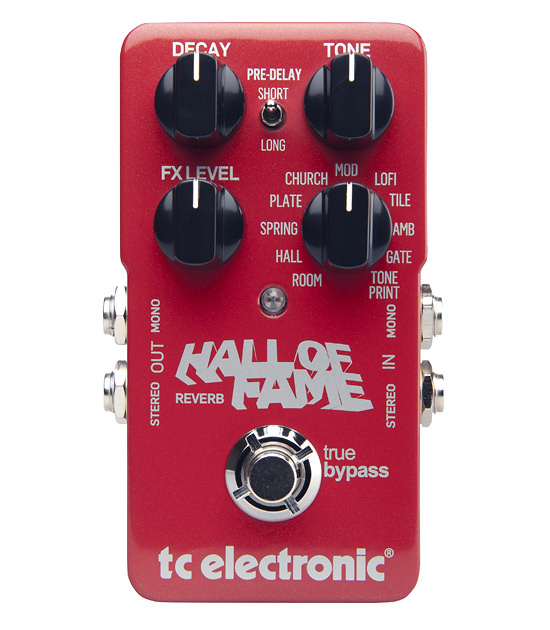 I had gotten it months ago from TC Electronic for review, and though I had written a “First Impressions” article on the Hall of Fame, I hadn’t gotten around to doing a formal review of the pedal. So the other day before my gig, I pulled it out, hooked it up and started tweaking knobs to really see what it could do. After about a half-hour of playing around with it, I was kicking myself for not putting it on my board sooner. Back in August of last year when I first got the pedal, I actually gigged with it a few times; both in my solo acoustic gig and my church band. But I had only used the “Hall” and “Spring” settings, which I did find to be superb. But my formal test revealed a certain character of the pedal that I hadn’t noticed before. It really took setting it up in my studio to discover its subtleties. What can I say? TC gear is always rock-solid and gig ready, and the Hall of Fame is no exception. The footswitch is solid, and provides nice tactile feedback when activating or deactivating the pedal. The knobs sweep smoothly and the pots have good resistance. I do not like loose-feeling pots, it feels cheap. But that’s certainly not the case with the Hall of Fame reverb. I dig the low-profile, small footprint enclosure. And while the pedal is light in weight, it just feel solid and well-constructed. Again, this is a trait of TC Electronic gear. I don’t do surf or real ambient stuff very often, so typically I like to use a reverb to add a little grease or provide a little expansiveness, and the Hall of Fame Reverb does this swimmingly well. I recorded some clips below. All clips were recorded with my Slash L Katie May plugged into the Hall of Fame, which in turn was plugged straight into my VHT Special 6 with a Jensen Jet Electric Lightning (even for a 10″ speaker, it produces a nice bottom end). The first clip starts out with a dry, then moves from Room to Hall to Church. Level and Decay are both set at noon. This was a test to see how the reverb provides what I call “distance;” that is, just as in real life, as you move to a larger and larger room, the guitar moves further away, and the sound bouncing off the walls provides depth. This is by far my favorite setting for acoustic guitar plugged directly into a PA. As the name implies, “AMB” stands for ambient, and it is meant to simulate room ambiance, but not actual reverberation off the walls of a room. As such, it’s a very subtle reverb with an extremely quick decay. It adds just a touch of grease to smooth out the signal. Combined with my Yamaha APX900’s ART pre-amp system, I get a very natural sound. And unless I’m playing a song that requires a bigger room sound, the pedal is set to AMB for 95% of the songs I play. When I first started playing around with this setting, I didn’t like it much. I’ve never been much into cathedral settings. But slathering on the wetness level while shortening the decay, makes for a very useful super-ambient sound that I actually used for a few songs over the past few days. It works real well. This is definitely a keeper. I love that it is true bypass, so switching it on and off doesn’t produce an audible a signal pop. And owing to its pedigree, this is a great pedal that can easily find a home any board. Of course, as sort of a Swiss Army Knife type of reverb, it could never substitute a real spring or plate reverb or something like a ToneCandy SpringFever. But to add a bit of grease and providing different reverb sounds, the Hall of Fame reverb performs wonderfully and it does it at a price that’s very affordable, and that’s always a good thing! Actually, I don’t know how profound I’ll actually be, but something I learned many years ago has had a profound effect on how I live my life, and on a smaller scale, how I approach playing music. Today’s thought was spurred by a New York Times article on “Mindfulness” that a friend shared on Facebook this morning. In reading the article, I looked back to a time before I was married and doing a lot of soul searching; trying to find the true essence of “me.” In the process, I learned about living in the “NOW,” and always being present. As one person was quoted in the article, “Intentionally paying attention to the present nonjudgementally” is what living in the “now” is. Developing that sense though isn’t easy because our lives are filled with constant distractions. To live in the now requires quieting the mind. Though it might seem paradoxical, by making our minds still, we actually expand our awareness – of everything. We become responsive as opposed to reactionary. Response is intentional while reaction is instinctual. Big difference between the two. So what does any of this have to do with playing guitar? One habit that I’ve gotten into before I start any gig is a few minutes before I come to the microphone, I find a quiet place, or just sit at my rig, close my eyes, and do what I call “drain my mind.” I take myself to a place where I’m not thinking about work or other things that would worry me. I think about the first song I’m going to play, and tap into the emotion of the music and the meaning behind the lyrics. Then I try to feel the energy of the crowd. Once I’m “hooked up,” I start the first song. It’s not really psyching myself up – lord knows I don’t need any motivation to perform. 🙂 It’s literally clearing my mind to open myself up to the songs I’m singing and even more importantly, tapping into the energy of my audience. I’ve found that when I’m bothered or distracted, it affects my performance. That probably goes for pretty much anything I do, but especially with playing guitar – whether I’m gigging or in the studio or just playing alone – if my mind isn’t clear, I have a hard time expressing myself, and my performance is just flat. For example, a couple of weeks ago, I was really bothered by a programming problem that I was working on solving, and I spent most of my time on the way to my gig thinking about it. I set up my rig, still ruminating over the problem, then I started the gig without first draining my mind. The net result was that I was just going through the motions. The point to all that is that when we quiet our minds, we open ourselves up to all sorts of possibilities, plus we allow ourselves to focus more intently. I know that seems paradoxical, but I’ve found that in order to focus, we have to first drain our minds to expand our awareness. Only then can we focus. Silver Luthier… How Far Would You Go to Put on Your Bling? Got a press release today from a publicist hawking a company called, “Silver Luthier.” These guys specialize in solid sterling silver bling to put on your guitar. Check out that solid silver flame tailpiece to the left. That’s freakin’ cool. It’ll also set you back $1200. Ouch. Or, not satisfied with your Les Paul’s Rhythm/Treble toggle switch cover? You can get a solid silver flame cover for only $180. Look, I don’t want to knock these guys. This stuff is seriously cool, though I know it’s definitely not for me. Besides, I have enough to worry about over my playing than to worry about how I look while I’m playing. 🙂 But more power to those who can accessorize their guitars with this stuff. Yup, Customer Service Absolutely Counts! While I look at a lot of gear at big box retailers like Guitar Center, ultimately my business goes to the two local shops near me. The reason is because of their superior and personal customer service. No one walks into those shops without the shop’s employees taking a look, even if they’re with another customer. But it’s not just the attention, it’s also the little things that they do that keep me coming back again and again. For instance, Guitar Showcase in San Jose, CA has a lifetime guarantee on their in-house made cables. Last night, my guitar kept on cutting in and out, and I traced it to the cable that connects my pedals to the restaurant’s PA board. Since I have another gig tonight, I went down to Guitar Showcase to get a new one. Bringing in the old cable, I told the guy behind the counter my cable failed at a gig last night and needed a replacement for my gig tonight, and he promptly told me to get one off the rack. That’s a little thing for sure, but it’s huge as far as customer service is concerned. That’s why even though I might pay a slightly higher price in the independent shops, I’m willing to pay it because of the feel-good factor I get from their excellent customer service. As I’ve been getting more into playing with modes, there are still times where I sometimes blank; or sometimes, I’m just not “feeling it,” but I have to play a quick solo. In that case, I fall back into the venerable, old minor pentatonic scale. Yeah, it can be pretty boring, but there are a few ways to liven things up. I found some cool videos on YouTube with the same info I learned over the years that has helped me get beyond the monotony. 1. This one is my personal favorite, and something I’ve used A LOT over the years. It’s presented by Scott Henderson. In essence, he demonstrates a way to use the minor pentatonic scale in a modal way. 2. This next one I learned years ago to break out of the “box” patterns and play the minor pentatonic up and down the fretboard. Of course, knowing the patterns and playing them effectively are two completely different animals. Especially with the pentatonic scale, it is VERY easy to sound like you’re playing a bunch of scales; especially if you play the notes in order and even more so if you always start at the root note (of which I admit is something that took me a long time to break myself). 🙂 Even if you’re playing in the box, you can add chromatic passing notes (as in the blues scale that adds a flat-5), and more importantly, you can break up the monotony simply by doing rhythmic embellishments like playing in groups of triplets and also adding sustained notes to let your solo breath. And guess what, he’s mostly in the minor pentatonic scale, but adds some diminished passing notes. Pretty amazing stuff! Unlike that absolutely stupid Rolling Stone article on the 100 greatest guitarists of all time, I’m not going to be an absolutist with my top 5 list of guitar inventions. I’ve actually been thinking about this subject for well over a year, ever since a journalist contacted me asking for what I thought were the top 4. Five’s a better number. So what did I base my top 5 on? A lot of my ruminations on the subject centered around utility from the perspective of an active player. So what you won’t see in my list are things like the invention of the pickup. To me, that was way too obvious of a choice. Same thing with the invention of the tube amp. The things I wanted to focus on don’t necessarily have widespread impact, though some certainly do. But they’re things that wouldn’t be the first things that come to mind. Now granted, I’m speaking from my own perspective, and I realize that others may have their own. But as I mentioned above, I’ve been thinking about this list for well over a year now, so I didn’t come up with this quickly by any means. Capo – As humble as it is, the capo has made a HUGE contribution to music, allowing players to play in different keys, using root chord shapes. It has probably saved a lot of hands from carpal tunnel as well. 🙂 And anyone who calls the capo a “cheater” is full of it. Tell that to the likes of James Taylor, Keith Urban, and Keith Richards (yes, I’ve seen him play with one). Not only does a capo allow you to play in different keys using root chords, they ring much differently because of the open strings. Strap Locks – It takes only one time of dropping your axe when it comes off your strap to learn the lesson and get a set of strap locks. ‘Nuff said. Electronic Tuner – Electronic tuners are far more accurate than any ear tuning. I used an old Seiko tuner for years, then moved onto different kinds. I still use my Boss TU-2 on stage, though I use a Peterson strobe tuner in the studio for more accuracy. Attenuator – These have been around for a long time, and I realize that not everyone uses them, but you’d be surprised at some of the big names that put an attenuator to use, like Joe Satriani, Steve Vai, and Steve Miller. To me, getting an attenuator was a godsend when I got into tube amps; not just in the studio, but also on stage, allowing me to kick up the power on my amp to get the preamp AND power tubes saturated but at the same time keeping my volume down to manageable levels. Big game-changer for me. Gig Bag – With the right gig bag, you can transport not just your guitar, but also all your cables, spare strings and accessories. I actually laughed when I thought of this one because out of all the items I chose, this was the one that I completely took for granted. I used to lug a hard shell case to gigs for years. Then about 10 years ago, my wife surprised me with a padded gig bag for my acoustic on my birthday. Now practically all my guitars have both a hard shell case and a gig bag for transport to a gig. So there’s my top 5 guitar-related inventions. Yeah, they’re pretty pedestrian choices for the most part, except for the attenuator. To tell the truth, I distilled this list down from a lot of things, but in the end, I focused on the most useful things. It wasn’t easy.